Despite sealing their Women’s EHF Cup quarter-final spot a week ago, Turkish side Kastamonu Belediyesi GSK denied Gdynia their first points in this current European season beating the home side 27:26. 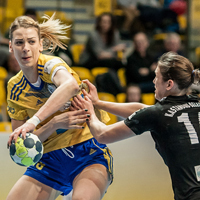 After playing in the Women’s EHF Champions League this autumn, Polish champions Vistal Gdynia wanted to sweeten their bitter European pill and end their European campaign with a win. Unfortunately for the home fans in Poland, their side were close, but the visitors from Turkey were too strong and took both points to reinforce a miserable European campaign for Gdynia who made it 12 losses out of 12 in EHF competitions this current season. The bright spot for Gdynia during this unfortunate season has been Aleksandra Zych, who will move to Metz in the summer, and her 10 goals tonight propelled her to second in the Women’s EHF Cup scoring charts on 41 strikes, one behind Kastamonu’s Serpil Iskenderoglu, who registered four goals this evening. It had looked good for the Polish side in the 24th minute as they led 11:7 but six minutes later Kastamonu had reduced the gap to 13:12 as the match went into the break. This did not cause Gdynia to take their foot off the gas however as they soon restored their four-goal advantage, making it 21:17 midway through the second half but a lack of experience in the closing minutes cost them dear. 120 seconds from the final buzzer the Polish side were still up 26:25, but Elif Aydin and Yana Uskova scored two goals for Kastamonu to turn it around and claim their fifth victory in the group out of six matches to ensure they cannot be caught in top spot, going into the quarter-finals. Second place in Group C will be determined on Saturday (10 February) in the Scandinavian duel between Viborg and Byasen, who are both level on six points.